Mon, Jan 21, 2019, 08:22 pm SL Time, ColomboPage News Desk, Sri Lanka. 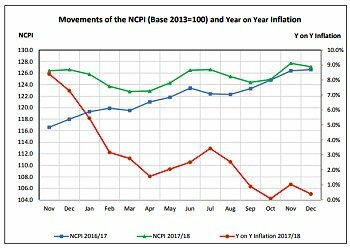 Jan 21, Colombo: Sri Lanka's nationwide inflation in December 2018 determined under the National Consumer Price Index (NCPI) declined to 0.4 percent from 1.0 percent recorded in November 2018 on a year-on-year basis, the Department of Census and Statistics reported Monday. The NCPI for all items for the month of December 2018 marginally decreased to 127.1 from 127.7 in November 2018. The decrease in the index point by 0.44 percent was due to the expenditure value decreases of food items by 0.17 percent and non‐food items by 0.27 percent. Year on Year inflation of food group has decreased from ‐3.9 percent in November 2018 to ‐4.5 percent in December 2018 and that of non‐food group has also decreased from 5.2 percent to 4.7 percent during the month. On year on year basis, contribution of food commodities to inflation was ‐2.08 percent in December 2018 compared to that of December 2017 while contribution of non-food items was 2.49 percent. The moving average inflation for the month of December 2018 is 2.1 percent. The corresponding rate for the month of November 2018 was 2.7 percent.